New Albany, MS– The annual Down from the Hills Heritage Museum and Mississippi Bluegrass Competition is set May 21, 2016, at the Union County Fairgrounds. Competition will begin at 10 a.m. in this the 15th year for the festival that selects the top old time music makers for the state.. The festival moves back to the fairgrounds this year, said Jill Smith, coordinator and Director of the Union County Heritage Museum. “We are grateful that we have the great space at the Fairgrounds available to us this year. The covered arena makes it possible to have the event rain or shine and the big trees make for great shade tree jamming. Cost of admission is $5 per person and 12 and under get free admission. Bleachers are available at the event and lawn chairs are welcome there. Down From the Hills Festival and Mississippi Bluegrass Championships started as a small bluegrass gathering about 15 years ago. It’s been hard to keep up when it was exactly, but it really grew out of Mr. Roy Miller’s Music Store get-togethers on Saturday mornings, said coordinator, Jill Smith. Mr. Miller always had a “drop in and play a spell” meeting every Saturday morning. His music store was on Bankhead Street, and when you went in, you never knew who might be there playing. You could either grab a spot and join in, or grab a chair and listen. He was a great guy and loved bluegrass music. He kept the coffee pot hot, and at 12 noon, the session ended. Mr. Miller died in 2007, a year or so after he closed his music store. He was a supporter of the festival in the early days. variety of people coming to the event,” Smith said. Special performances by National Dobro winner Johnny Bellar and National Banjo Winner Weston Stewart will be highlights of the event, Smith said. Other performers who are top in their fields will be vying for the top awards in the state. This year’s event will be judged by the winner of the National Dobro Competition Johnny Bellar. “Johnny has helped us for several years after he won the competition. 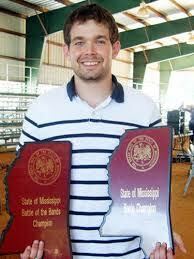 He will judge and perform this year as well as Weston Stewart, winner of the National Banjo Competition. Both will perform during the competition. Other judges who are also musicians include Jake Landers, Ken Goodrich and Kay Bain. “As people get ready for their part in the competition, visitors can hear some pretty fabulous shade tree picking,” Smith said. Known affectionately as “old time music, it was played at homes, in churches and at public events during a time when the culture was more rural. The melodic roots of the music come from many cultures such as the Scots Irish tradition and shaped also from the African American banjo tradition. As it evolved, old time music picked up material from other music styles such as blues, ragtime, and gospel. Who may compete in the Bluegrass Competition? Typically contestants from Mississippi, Tennessee, Alabama, Arkansas and Louisiana come to this event, which pays cash awards to both youth and adults. The competition is open to all, Smith said. Each competitor pays $5 per competition and there will be a bluegrass band competition as the final portion of the event. The band winners will take home $1500, for fist and $500 and $250 for second and third. Approximately $8,000 in all will be earned by the winners, young and old. This event is supported by Visit Mississippi Development Authority, Mississippi Arts Commission and the City of New Albany and the Union County Historical Society and its Community Partners. There will be food vendors for hamburgers, hotdogs, tomato sandwiches, kettle corn and baked goods. and vendors with handmade goods. If any crafts people would like to set up their wares, please plan to do so by 9 a.m. and bring your own tables. No flea market or imported merchandise, please. For more information call 662-538-0014 or email jill@ucheritagemuseum.com or go towww.mississippibluegrass.com for rules and entry information.